A little while ago I took one of my besties from Cowtown, who was visiting, out for coffee and a little toodle through some of the local antique shops. 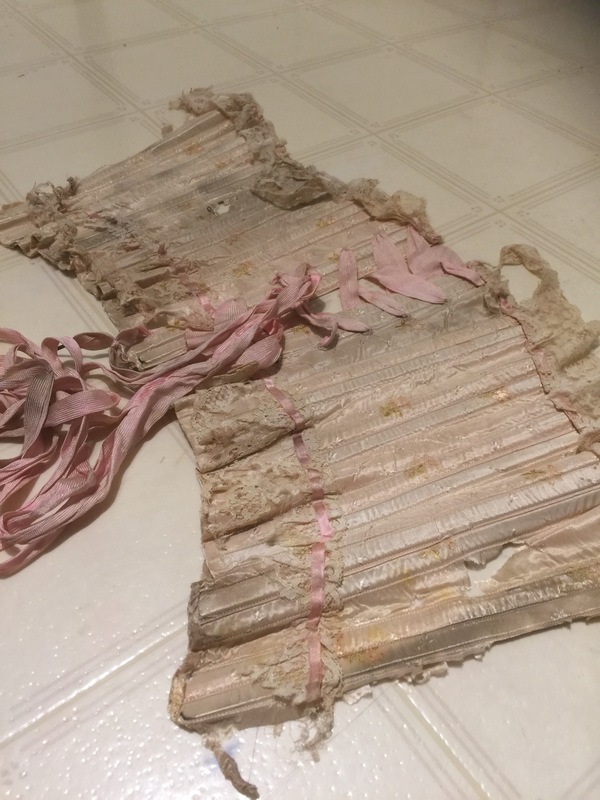 She didn’t find anything, but one place that sells a charming, or possibly annoying, array of select antiques and hipstery artisanal doodads, had a shabby little antique pink corset on display. Naturally, I had to inquire as to the price. It was right (as it should be given that the condition is, well, let’s just say not museum quality. 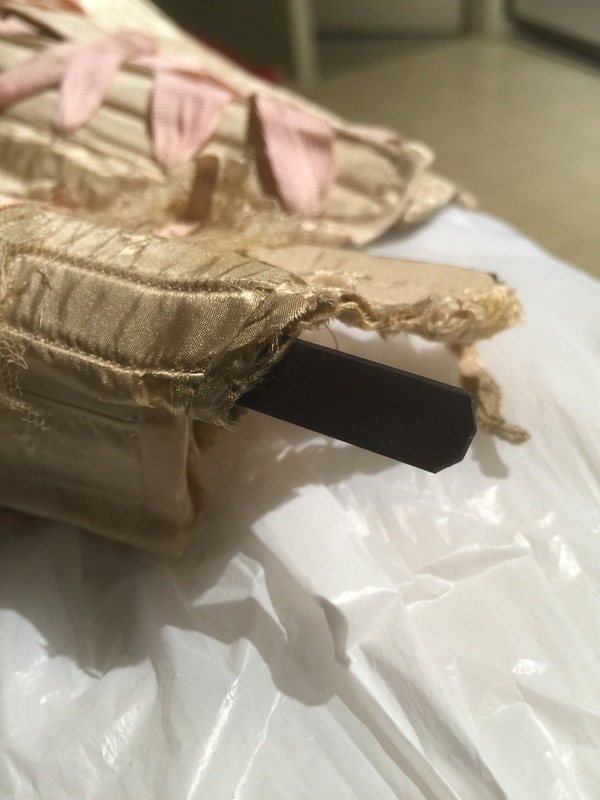 😉 ), so I came home with an authentic Victorian-ish little corset. Most sadly, it is missing the front busk entirely, so I don’t know how big most of it would have been. Only the very top edge is complete: about 15″ per side. I don’t think it would have reached up to the full bust, so it’s maybe not actually as tiny as that first appears: 15″x 2 + 2″ lacing gap is 32″, which would actually quite possibly have fit me. 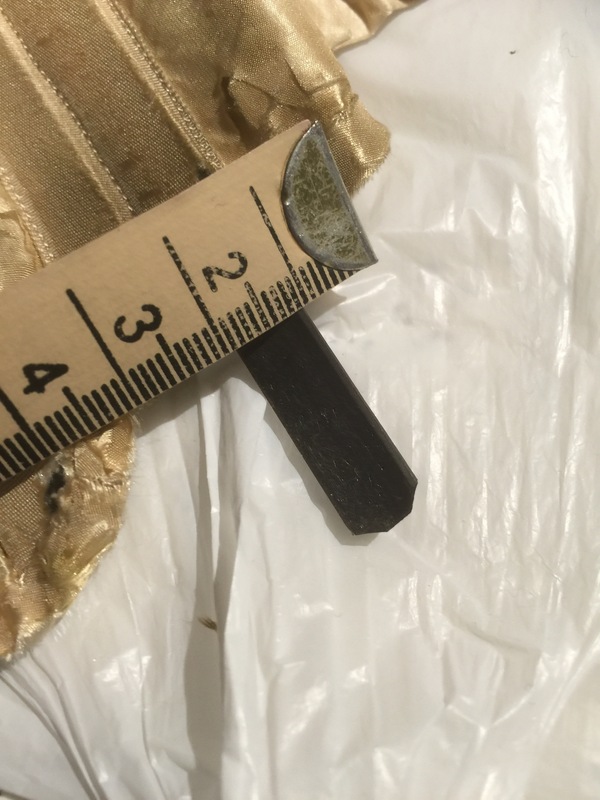 Surviving half waist is 23.5 cm (9 1/4″), but this is short at least 2.5 cm (1″) and probably more like 4-6 cm. 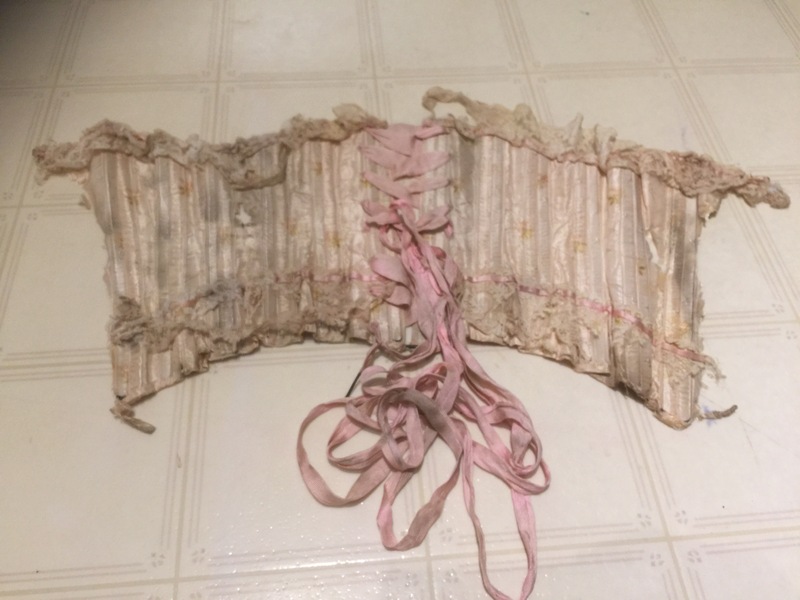 If the original waist was 11″ per side, that would work out to about 24″ total for a 2″ lacing gap—too small for me but a very reasonable Victorian waist size. 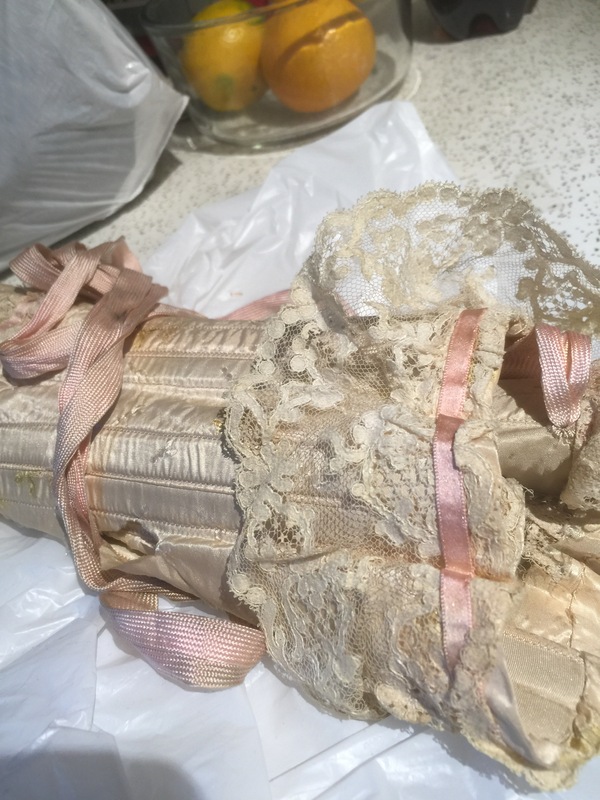 It’s made of two layers of rather shattered silk in a pale ivory/blush colour; the outer layer has a brocade pattern of scattered tiny flowers. 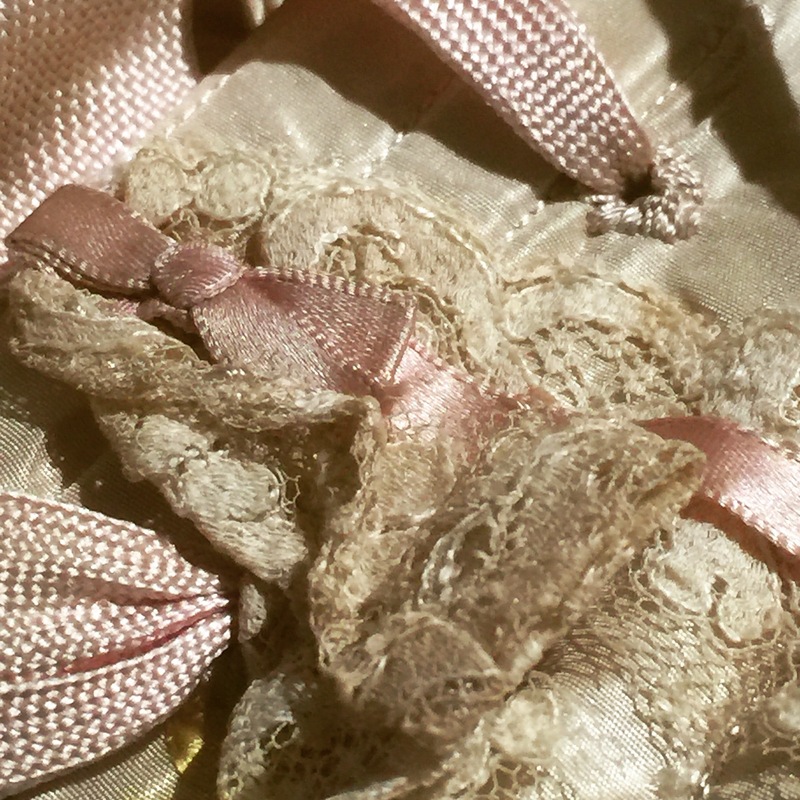 There is a wide (6cm, 2 1/4″) lace trim both top and bottom, stitched down along a narrow pink ribbon. 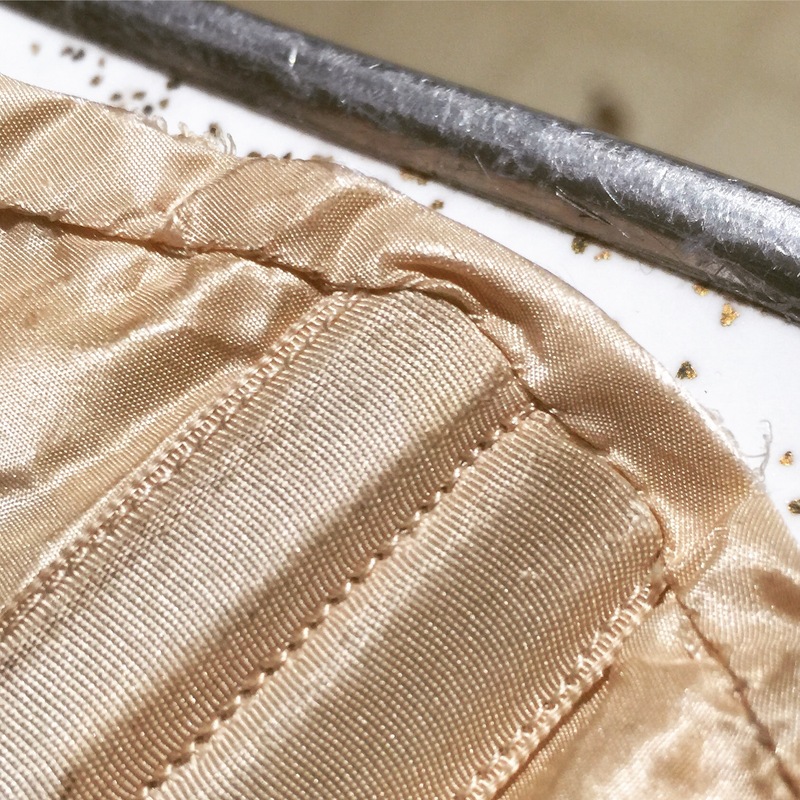 It’s made strictly in panels (no gores or gussets), six to each side, and boned along each side of each seamline, with two bones at each side of the back lacing. The shaping appears to be fairly slight, though it’s hard to get a good sense of the shape without stuffing it on something. 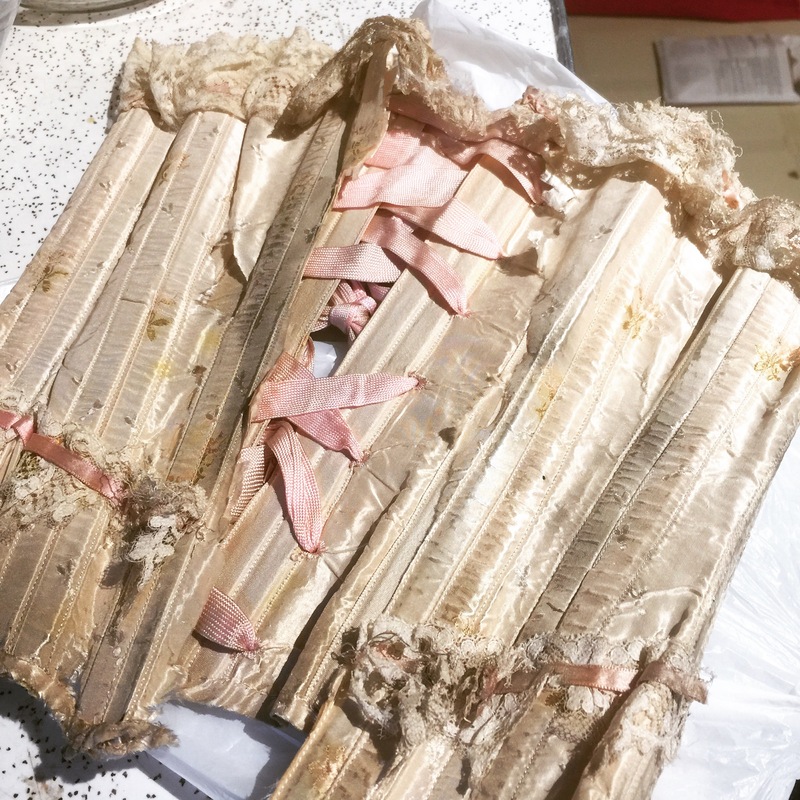 The bones are stitched into ribbon casings on the inside. The binding was machine stitched on the outside, and then hand-stitched down on the inside. I am assuming these are real whalebones. I’ve never actually seen the real thing to compare. They are flat, thin, very light, and still quite springy and flexible. The lacing runs through tiny handstitched eyelets, no metal grommets, so it wouldn’t have stood up to heavy tightening. The lacing appears to be original, and is a wide, flat woven tape that compresses very tiny to go through the tiny eyelets. It is tipped with long, dark metal tips at the bottom ends, but all the extra length is pulled out and tied at the waist. 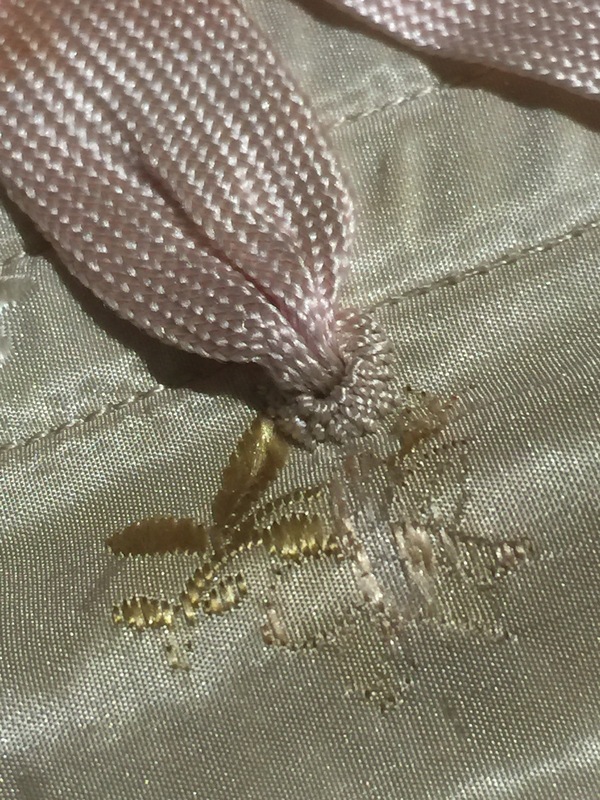 The pink ribbon anchoring the lace has teeny bows at both front and back ends. It’s quite exquisitely delicate. I only wish the busk, or whatever front closure was used, had survived. You are quite lucky to have this original piece! So beautiful! Do you follow “The Modern Mantua-Maker”? She does lovely garments like this too. Interesting find! It must have been beautiful in it’s day, and kind of still is even in it’s tattered state! Such an interesting find! 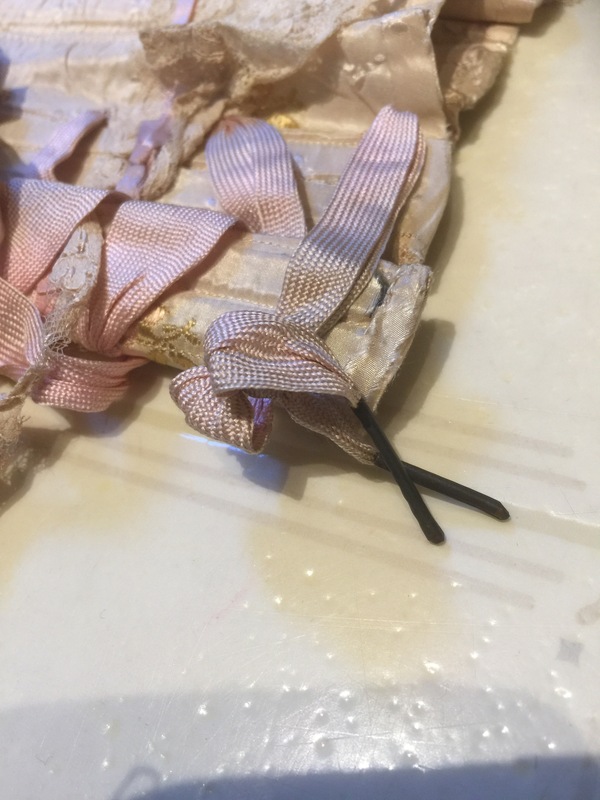 A method of copying that I have used with delicate items is the one that Kenneth King uses in his Craftsy Jeanius class–pin silk organza smoothly over each piece and trace it onto the organza with pencil. I’ve used poly and even that pattern-making fabric stuff too, although you often have to use pen or something rather than pencil. 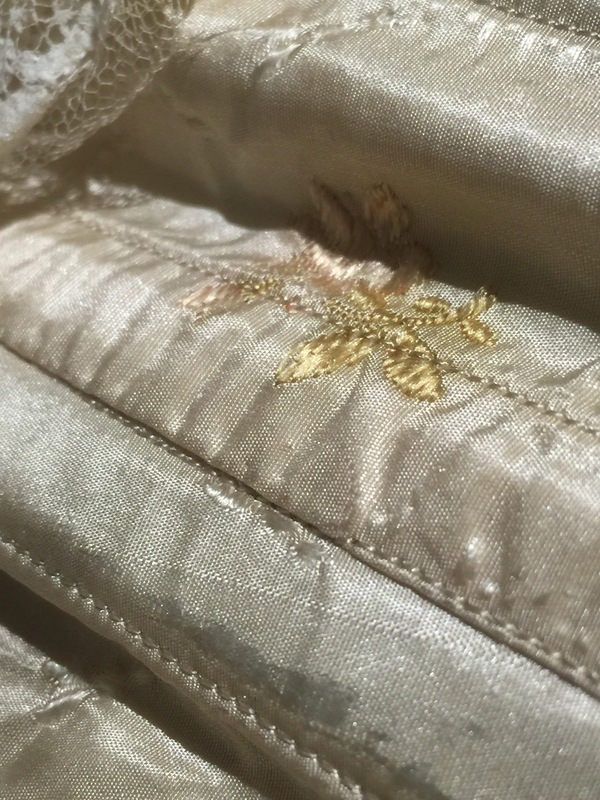 He suggests outlining the pattern pieces of the original garment in thick thread with hand stitches to make them more visible under the organza, but I don’t know that you would want to risk it with such delicate fabric. This is fascinating! Thanks for sharing. I’ve got a book called Patternmaking for the Perfect Fit by Steffani Lincecum – the title is misleading as it is really about all different kinds of ways to take a pattern from an existing garment without taking it apart. The author is an experienced costumer so she really knows her stuff. She also has a craftsy class on the same topic, but it isn’t less comprehensive. I have seen that book though I don’t own it! I agree, misleading title but great info. I want to hear your thoughts about it! And this truly is amazing. Such wonderful research.